I'm excited to start off the week with a project reveal that we worked on for the majority of this year! We see so many homes built in the 1990's that have become outdated and almost soulless over time. The combination of oak trim, brass knobs, and matchy-matchy light fixture sets just isn't standing the test of time and doesn't quite reflect the unique aesthetics of homeowners in 2017. Our latest 90's home renovation is set in Pleasant Prairie's picturesque and architecturally diverse River Oaks neighborhood. My Clients bought this home knowing that they would need to make updates in order to truly make it feel like a home for their family. The house was very specific to the previous owners' style, with hand-painted murals on the walls and frilly window treatments. The layout of the home was nice and open, but the multiple types of flooring made the first floor seem small and disjointed. Despite its size (17' along the back wall), the kitchen didn't have a lot of storage. The pass-through window leading to the four seasons porch cut out a large portion of cabinet space and the oddly shaped island only got int the while cooking. When our Clients brought us in, they initially just wanted a new island in the kitchen and hardwood flooring installed throughout the house. The more we got to know them and their style, the more it was obvious that the first floor of the home needed a more comprehensive makeover in order to fit their storage needs and reflect their personal aesthetic. The Clients wanted a design that had elements of Traditional and French Country design, without being too on-the-nose. In order to pull the house out of the 90's and marry Old World touches with modern conveniences, we had to completely transform the heart of the home - the kitchen. We ripped out the speckled high-pile carpet in the living room and dining room and the 12x12" contractor-grade white tile in the kitchen and entryway and put in a rich medium-toned maple hardwood floor throughout. We painted the oak woodwork throughout the house in Benjamin Moore's Chalk White (BM 2126-70) and contrasted it with a dark grey crown molding in Benjamin Moore's Escarpment (BM CC-518). The darker crown molding adds an interesting architectural element, making the home feel more Traditional and elegant. The darker color is then balanced out by the graphite quartz from Artisan Counters and the rich-toned maple flooring from Kentwood Floors. The Escarpment color also pulls out the glazing treatment on the cabinetry, making the recessed panel detail shine. My favorite element of the remodel is this gorgeous island in a beautiful saturated French provincial blue tone. Instead of the oddly shaped island shown in the before photos, we added a deep 8-1/2 foot long island that houses storage on both sides, the dishwasher, a cast iron sink and seating for 2. We also were able to get more storage in the kitchen by taking the upper cabinets to the ceiling and by closing up the pass-through window to make room for a large pantry and refrigerator. The color of the island really pops and pulls out the cool tones from the stunning marble mosaic backsplash from Soci, Inc.
After installing the new kitchen, floors, lighting, and painting the woodwork and walls, we decided to also wash the two-sided fireplace with a dark charcoal stain to tone down the red brick. Now that the fireplaces are darker, the white mantels feel more luxurious. I love that we were able to photograph the house with my Clients' Christmas decoration up. The house feels so homey now and is well set up for entertaining their family. The elegance and warmth of the design make it the perfect Christmas house! There are more angles and details from this project in our portfolio - check them out here. Is your home stuck in the 90's? We can help! Let's talk about how we can transform your outdated or inefficient space into your dream home! Contact JZID today to get started. After photos taken by Kayser Photography. Happy Monday! I wanted to kick this week off with a sneak peek into one of my favorite projects that we have been working on over the last few months. In early 2017 I was hired by my Clients - a lovely and adventurous couple from Northern Illinois - to furnish their new condo in Milwaukee's hip Bay View neighborhood. The condo was feeling very Midwestern despite having exposed ceilings and a very cool metal spiral staircase. My Clients wanted their getaway condo to fit their unique blend of aesthetic preferences - classic Mid-Century Modern meets Industrial with a touch of Traditional through furniture frames they already owned. We reupholstered antique furniture frames, hung existing artwork, painted all of the walls (including the trim in black) and purchased new furniture and rugs. We still have one area to furnish and might be making slight updates in the kitchen, but I wanted to share the in-progress photos. It's really coming together! Need help creating your home away from home? Contact JZID today to get started. I'm excited to share our latest project reveal - a master bathroom in a quite Mequon neighborhood. JZID turned an outdated bathroom with a cramped layout into an airy master retreat. There is no getting around it, the bathroom is part of our daily ritual. It is the space where most of us start and end our days. And although the basic functions of the bathroom continue to be the same each and every year, bathroom trends have really changed from when my Client's home was built in the 1990's to today. Not much had changed in this bathroom since the house was built - painted faux wallpaper, old oak cabinets and square tile galore (even as the countertop). It was definitely time for a refresh. While the finishes were outdated, the real driving force for my Client wanting this remodel was the layout. This bathroom fell victim to a lot of errors that were often made in suburban homes in the 80's and 90's. It was very common with new builds of this era to try and cram in as many features as possible. In a way, the builders had the right idea when focusing on resale. I mean, who doesn't want a nice freestanding bathtub and double vanity, right? Where they went wrong was the wonky layout of all of these pieces. A Jacuzzi tub filled up most of the floor plan, leaving the toilet feeling shoved in the corner and the shower too cramped for adults. And don't get me started on the sinks! An angled vanity only makes sense if there is enough clearance so two people can use the sinks at the same time without bumping elbows. This set up definitely didn't satisfy that rule. The goal of this remodel was to simplify the layout of the bathroom and update the finishes. We would have loved to give our Client a nice freestanding bathtub, double vanity, walk-in shower and a ton of storage, but the size of the room just didn't allow for that - it is just shy of 100 square feet. So, we had to prioritize and a spacious shower and storage won out in the end. To get away from that awkward angle in the wall, we squared off the corner of the room by eating into a hallway closet that wasn't being fully used. By doing this we could now fit in a double vanity along the wall parallel to a new walk in shower where the Jacuzzi used to be. This freed up the space where the shower previously was located to be for a nice large linen cabinet that hides extra towels, toiletries and laundry baskets. We blocked off the world's most narrow built-in cabinet and did a nice tile wrap-around instead. The only thing that stayed the same was the toilet placement! My Clients wanted a design that was bright and airy, while still fitting with the rest of their traditional home (think: oak trim, classic color palettes and touches of ironwork in the lighting). We created a design that focused on enlarging the space through the use of glass panels, over-sized mirrors and elongated tile. The color palette is light - the walls are painted in Sherwin William's Light French Gray (SW 0055) and the wall tile from Marrazzi is in a glazed white glossy finish that really amplifies the natural sunlight coming in from the window and from the ample fixtures we installed. We then paired these light elements with high-contrast dark wood cabinets from Master Brand and a graphic marble mosaic floor tile (featured in this blog post about our favorite tile!). For the bonus, we installed heated floors to add in that luxurious element everyone wants in their master en suite! The effect is a well-balanced design that is timeless and functional. Does your bathroom fit your lifestyle and design preferences? If not, let's talk about how to create your personal oasis! Contact JZID today to get started. To combat the rain and gloom in Milwaukee over the last few days, I wanted to channel warm breezes and lemonade with my latest project reveal! January through May of this year, we were working to remodel a lakefront property on serene Pretty Lake in Dousman, WI. This was a big job! My Clients were brave to even buy the house in the first place. The dimensions of the rooms were strange, the upstairs didn't feel secure and there was an awful smell throughout the house. I knew it was a gut job at first glance, but the Clients were ready for the challenge. And I'm glad they were because the end result is spectacular! Saying that the house had outdated finishes would be an understatement! And it was clear that the kitchen wasn't built for modern appliances - a refrigerator shouldn't be blocking the doorway like that. Despite these major design faux pas, we could tell that the overall bones of the house had potential. Kitchen overlooking the front entryway and garage entrance. You can see the potential in the space, the layout is just inefficient! Family room off of kitchen with a non-functioning fireplace. Sitting room off of family room with access to upstairs bedroom and the backyard. Half bath off of master bedroom. Yes, that is a wall of mirrors! Master bedroom with small deck overlooking Pretty Lake. The original layout of the house wasn't as efficient as it could have been. The first floor felt closed off due to a series of rooms blocking the view to the lake and the second floor just made no senses. There was a large walk-in closet but the smallest bathroom possible that didn't even have a shower. Like any project, we kicked off the remodel with finalizing the new layout. The new layout now had a large kitchen and dining area, an extra bedroom, a shower in the master bedroom and great views to the lake. The first thing we did was open up the walls to the hall and utility room so we could reclaim these areas as an open-concept kitchen and dining area. We carved out a new bedroom from the existing living room and added a fireplace and sliding door to the backyard in the sitting room. One of the biggest changes was switching the orientation of the stairs so we could fit in a shower and large closet in the master bedroom. The floor plan is now much more open and there are clean lines of site to the lake view. The demo phase is always my favorite part of a project. Here are two amazing views from this winter when all of the walls were knocked down and the lake was frozen over. My Clients wanted a home that was durable enough for their kids and pets to run around in, but luxury enough that they could move in full-time after the last of the kids went off to college. The design delicately balances these two often dueling requirements while highlighting the amazing lake view. The Calacatta quartz countertops are stunning mixed with the dark flooring (can you believe those are CoreTec LVT?!) and that arabesque tile makes such a statement! Do you need to go through a large renovation project? Contact JZID today to get started. Hope everyone is having a great end to the week. 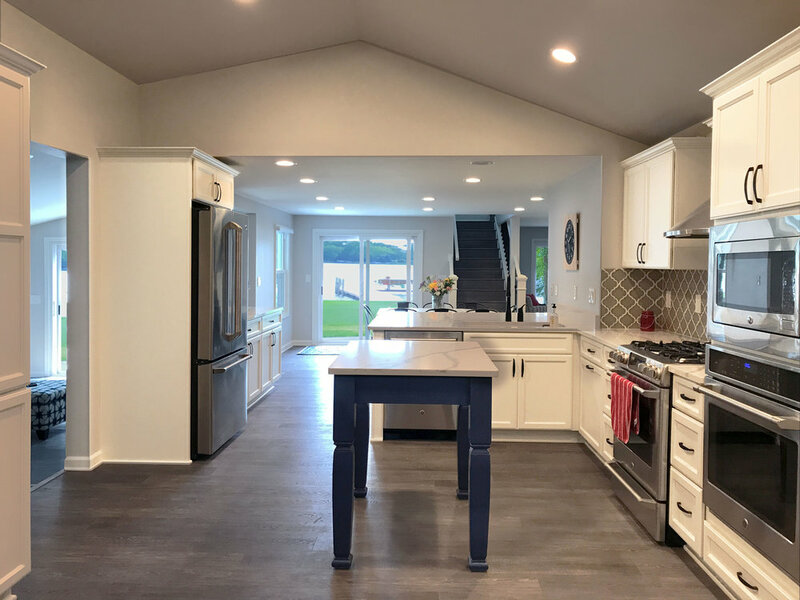 I have been working on a big remodel in Thiensville, WI where we did significant demo work in the first floor to build a new kitchen, laundry, half bath and office. The condo is in a great location, but it was just a bit outdated. There we are lot of narrow hallways and rooms that were just begging to be opened up. We are still waiting on counter top installation, plumbing and appliance hook-ups and styling. Everything will be done in February and I'll share final photography on my site. In the meantime, here are a few photos to show the transformation so far. Need help updating your home so it's more open and functional? Contact me to get started! I hope everyone is having a great Labor Day! I know that I am relaxing after my design presentation yesterday for a master en suite remodel. The client is near my hometown in Illinois, so it was nice to visit family for the long weekend and also be able to meet my client in person. My client currently has a large bathroom off of the master bedroom. For a 160 square foot bathroom, it's no wonder that my client wants to remodel - just look at that TINY shower. A 36x35" enclosed shower does not give them the spa-like feel that they want. Having this 64x85" large bathtub would be nice... if there was an equally large shower, because let's be honest, who is really taking a bath everyday when you work full-time? One super nice element of the current floor plan that I'm keeping is the separate water closet. Having a closed off toilet in an en suite is a must-have if there is room for it. To turn this bathroom into a spa-like retreat, the client had a few requests - a large shower with a built-in bench, a freestanding bathtub with hydro-therapy jets, elements of natural stone and wood and plenty of linen storage. This bathroom has the square footage, so these requests are all in the realm of possibility. Because this is pretty much a full gut remodel, I created two animated 3D renderings so the client can see what the finished space could look like before ever picking up the sledgehammer. I will receive revisions from the client and hear which layout of the bathroom works better for them later this week, but I just love both designs and wanted to share them right away! Design Option #1 follows the current footprint of the bathroom fairly closely. I'm rotating bathtub so it is perpendicular to the entrance, which leaves room for a large glass shower that measures 70x40" (about twice as big as the current shower). I kept the vanity where it is, but am swapping it out for a double vanity and separate linen tower. The materials are a mix of dark wood, Carrara marble , River Marble porcelain from DalTile and natural sliced pebbles. The overall look is bright and open with a mix of organic and timeless materials. Option #2 is a visually impactful design that optimizes the layout of the room. The configuration is changed so that the first thing you see when you enter the room is a marble feature wall with a floating bamboo vanity. This layout gives more privacy since the shower is hidden behind a tile wall and the bathtub cannot be seen from the bedroom. 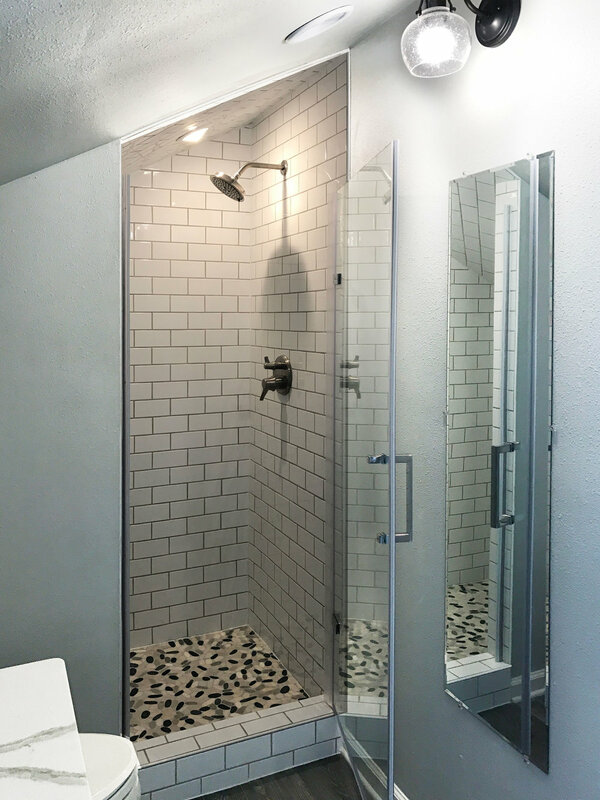 In addition to being more private, the shower is slightly larger than in Design Option #1 – 84” x 55”. Outside of the shower is a built-in tiled bookcase that can house linen and toiletry storage. In order to make room for the freestanding bathtub in front of the window, the water closet door is moved to a different wall and will swing inwards. The material choices in this design are bamboo, Carrara marble, travertine stone and glass mosaic tile. The overall look is more contemporary and compartmentalized. I'm in love with both of these designs and can't wait to hear which design concept the client wants to proceed with! Curious what your master bathroom could look like if it was remodeled to finally fit your needs? Contact me to get started to creating your new bathroom. If you live in the Milwaukee, WI area, then the chances are that your house has a few common characteristics with the rest of the neighborhood - 10" wood baseboards, archways blocking your open-concept plans, plaster walls, wood built-ins and small bedrooms with even smaller closets. This Craftsman architecture is definitely charming and cozy (and I even have it in my house), but it tends to squash some people's dreams of a more modern style. JZID was hired late last summer by a couple who just bought a bungalow in Shorewood, WI. They loved the location, but not the traditional Craftsman look. The clients brought me in to inject a bit of their industrial style into the home. There is one school of thought in design that leans more toward the "the design of the interior should fit the period and architecture of the house" mentality. I'm not disregarding that fully, but I do think that people should be able to have whatever design style they want in their home as long as they aren't ignoring the home's architecture. If there is some architectural feature that really speaks to the era in which it was built, then I think that feature should be highlighted in a way that makes it cohesive to the rest of the chosen aesthetic. 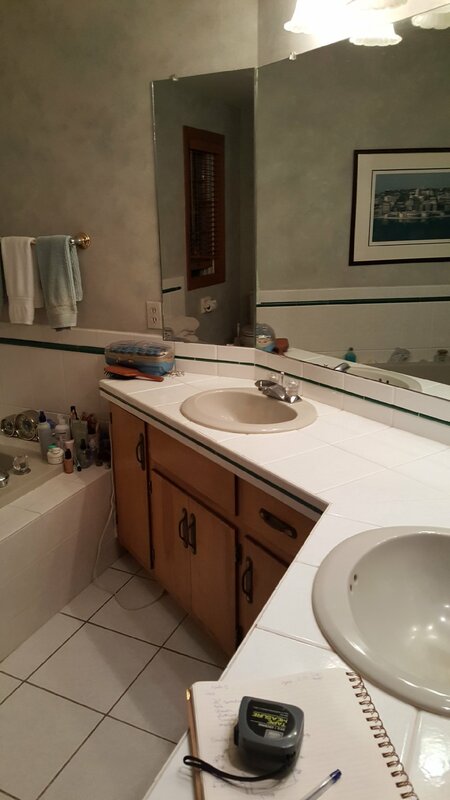 The photos below are from the real estate listing for this home. The house has a nice traditional look, but it definitely didn't have vintage or industrial touches. To start this design, I selected a color palette that would be reminiscent of an old factory - think grays, blues, leather, bronze. In the living room, I kept the floor plan pretty simple since it is a very narrow room. I added an apothecary chest, leather trunk and vintage accessories to bring some personality to the room . The (vegan) leather side chair fits the space well and matches the leather detailing on the trunk. A spotlight floor lamp and wire stool add a touch of metal to the room. A great feature in the house was this pass-through bar from the kitchen to the dining room. Typically in a Milwaukee Craftsman house, this would have been a built-in with drawers and a mirror, but the old owners must of had the top part cut out to open the floor plan. I love that they left the archway, so I highlighted this feature by painting an accent wall in dark blue. The kitchen was recently updated, but still had laminate countertops when my clients moved in. To give the industrial feel, we replaced the light fixtures and did DIY concrete countertops. The long-term plan is to transform the finished attic space into a master bedroom with walk-in closet and on-suite bathroom, but for now the clients are sleeping in a downstairs bedroom. Using the concrete finish that was applied to the countertops, I created a 3x3 concrete panel grid (sanded so the pillows don't snag) and mounted it to the wall behind the bed to give more texture to the room. I like the mixture of the hard concrete with the soft, billowy curtains and bedding. The second bedroom on the first floor was then transformed into a home office. Neither of the clients work from home full-time, so this office space serves mostly as a study for reading and light computer work after office hours. The sofa folds out into a bed so guests have a place to sleep when they visit. I really like the look of this piece, it is such a nice take on a typical futon. Write a brief description of your project. Over the last month I've been working on updating a Craftsman bungalow in Shorewood, WI. 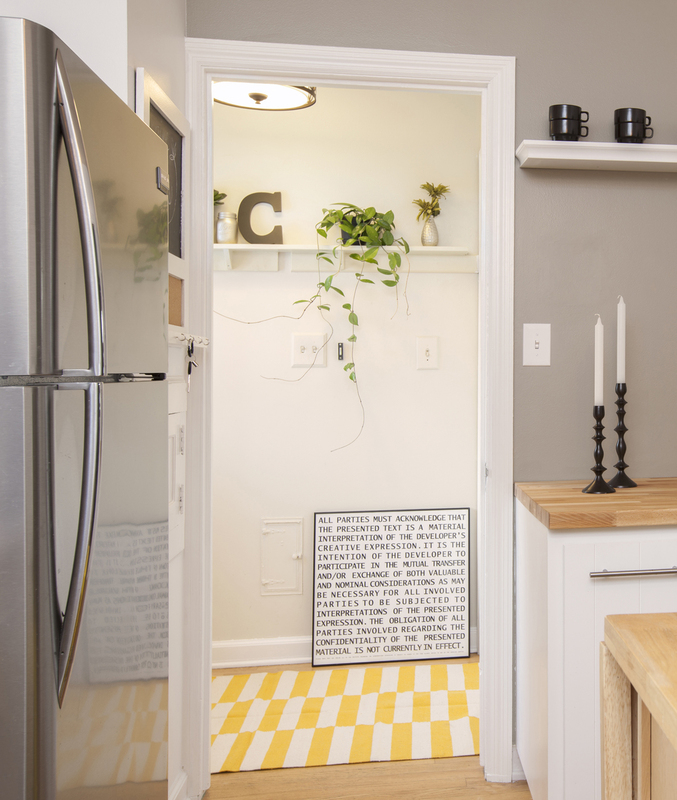 My clients hired me to transform the quaint house into a bold industrial-inspired space. Right now, I'm busy dealing with shipping and receiving the final items for the house, but I wanted to give you all a look at the progress made so far. Another main feature that I changed in the house was getting rid of faux granite laminate counter tops and replacing them with a concrete finish. I used this concrete treatment throughout the house to cohesively tie everything together (a concrete headboard here, a concrete lamp there). Nothing screams industrial like concrete paneling, so the image on the bottom right is a concrete panel headboard. I can't wait to shoot this space when the bedroom furniture has been moved in. Almost all of the furniture for this house had to be purchased, so I stuck with items that brought in reclaimed wood, distressed metal, burlap and sleek prints. You can find the bench and floor lamp from the image below in my shop. Something not yet shown is all of the light fixtures are being replaced, as are the faucets in the bathroom and kitchen. Since some items are on back order, I should have final photography up on my blog in mid-December. Happy 4th of July from JZID! To kick start the holiday, I compiled different interiors that have a patriotic color scheme throughout the year. Whether it is painting your walls in red white and blue, bringing in artwork that boldly makes a statement, laying tiles in the muted tone or setting a themed table - good ol' red, white and blue doesn't have to be limited to July. Have a fun and safe Independence day! When done thoughtlessly, a mattress on the floor will look like it belongs in a college dorm room. But, when executed well a platform bed can be inviting and cozy. While I love a high bed with a large statement headboard, I've totally jumped on the bandwagon with platform beds. Low beds can air on the side of a more modern, minimalist aesthetic, but can also work well in more rustic settings. See the images below for examples of low bed I love. 1. Keep everything low. A low bed will shorten the scale of the room. Lean your artwork against the wall, bring in low side tables, add a collection of baskets. All of these things orient the room lower so the bed doesn't look out of place. 2. Splurge on the bedding. Keep your bed looking luxurious by choosing bedding that is high quality, both in terms of material and looks. Whether you go with a white duvet or a bold pattern, make sure that the bedding covers the edges of the box spring and the mattress. 3. Tidy up. The bed is a lot closer to floor and the dust bunnies that would typically gather under your bed will need somewhere to go. So, keep it clean. Vacuum regularly and consider bringing in a rug to increase the comfy factor. 4. Keep it casual. With everything oriented lower to the ground, the look of the room will naturally be more casual. You can emphasize this by playing on a more neutral color palette and by mixing soft fabrics. 5. Create a pillow headboard. Whether you have a headboard or not, propping large pillows will add some bulk to your bed. Try pillows that have contrasting color to your bedspread. If you have a lighter bedspread then bring in pillows in a darker fabric. This will make your pillows pop and add some depth to the bed. As the weather starts to get a bit nicer, more and more remodels will get underway. The room predicted to be toward the top of the list is... the bathroom! Whether you want to transform the space into a quiet retreat for you to use at the end of a long day or simply as a powder room for guests, the bathroom is one of the home’s most functional and well-used spaces. 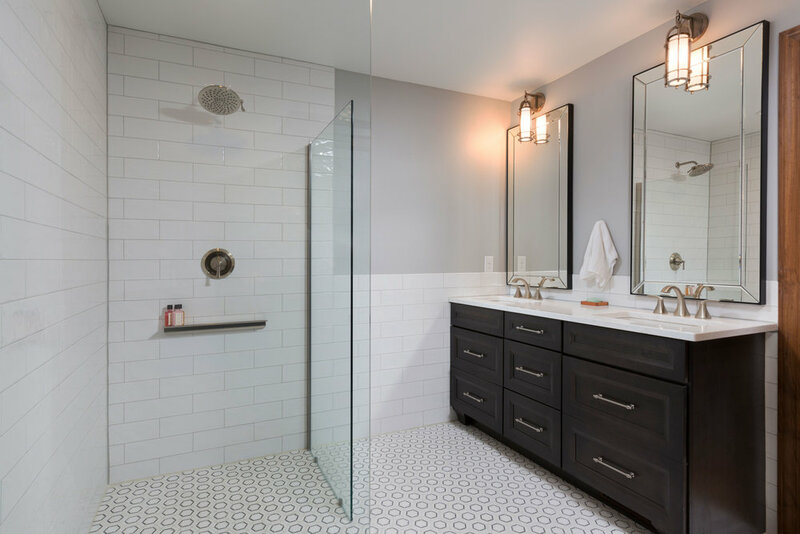 If you’re considering a renovation or even a light face-lift for your bathroom this year, then keep in mind the following five fabulous trends. 2. Natural beauty. Want a bathing area that’s welcoming and serene? Then drawing design inspiration from nature is a great way to warm a typically very hard room of the house and infuse the space with a calming vibe. You can achieve this vibe by introducing earthy materials like natural stone or wood-look tiles into the space. 3. Vintage touches. The all-white, sterile bathrooms that have been so popular the last couple of years are loosing it's stride. To keep your bathroom from looking like a cookie-cutter copy of everything else you see, try adding in some personality with vintage pieces. Just a few vintage pieces will do the trick - add a chandelier above a free-standing tub, a large gilded mirror or a vintage painting. 4. Custom vanities. You aren't limited by stock vanities from Home Depot. If you aren't seeing what you want on the market, then go custom. Custom vanities are made to fit your needs and aesthetic. The vanities can range from large drawer units or sleek modern shelves with sink bowls. Don't forget about the space above your vanity - the classic medicine cabinet is making a resurgence, but with a twist. There are a lot of products on the market that incorporate soft-close technology and have integrated lighting. It is a great way to increase storage while giving the illusion of spaciousness. 5. Interesting Fixtures. Gone are the days when the only selection of faucets are nickel-plated. Now bathroom fixtures come in a variety of interesting finishes and colors. Look for oil-rubbed bronze, warm-colored copper, brass, bronze, or powder-coated black/white fixtures. Good old plain stainless steel is still a safe choice, but the possibilities are endless. Need help updating your bathroom? Contact me today and we can redesign your bathroom to maximize your space and create the perfect aesthetic that is unique to you. Wes Anderson's 2014 film The Grand Budapest Hotel had a great awards season. Last night, production designer Adam Stockhausenset won an Academy Award for his work. As an interior designer, I highly appreciate the worlds that Wes Anderson has created across all of his films. Anderson's work is always brilliantly studied and fully realized through color, architecture, props and costuming. He creates visually astounding universes that exude personality. The genius in Anderson’s work is that he elevates color and form to same level as the story line. When we first see the Grand Budapest Hotel, the building appears a withered beauty past its prime. The 1960's garish green and orange lobby sticks out like a dye job crying for attention. But then, as the film’s narrator, Mr. Moustafa, recalls his lobby boy days in the 1930's, the camera races across a luxe red carpets and transports us into the fictional world of the hotel in it's full glory. The saturated red elevator, the layered textures of Agatha's room and the unexpected pops of pastels made a huge impression on me. In celebration of the wonderfully-crafted world that Anderson created, here are a few stills from the film. Anderson is known for having full control over each shot, which often makes the scenes look like a series of individual design tableaux rather than a motion picture. One example of a technique that Anderson uses to get his aesthetic across is symmetry. Below is an amazing video showing symmetry in Anderson's films. Happy Valentine's Day! Here are a few romantic interiors to kick your day off right. The most important room in your home isn't the kitchen or family room. It isn't even a room at all. I'm talking about your home entryway. The entry is the driving force that determines what unnecessary clutter will funnel into the rest of your home. The more organized this space is, the less clutter you will have throughout your home. If you have an older home, then it's possible you could have the bones of a nice foyer, hallway or mudroom already there for you to utilize. For newer homes and condos that have a contemporary open floor plan, however, you may have to get a bit more creative with setting up an entry. 1. Cater to your needs. Really think about what you do in this space. This basic tip applies differently to people from different regions. I tend to see Southern homes not having such an emphasis on removing your shoes before you enter the home as homes in Wisconsin or other places that have more variable weather. People in the Southwest probably don't need an umbrella stand permanently by their door like people do in the Northwest. For me, I use my entryway to remove and store my shoes, jacket and keys, as well as sort mail. Don't include any unnecessary elements in the design or it will just pile up as clutter. 2. Include a console or chest with drawers. Instead of throwing your keys and wallet on top of a console table, try having a designated drawer that you stick them in. This trick will lessen the tabletop visual clutter to make your space appear cleaner while still keeping your keys and wallet in a safe space that you can easily access. No room for a table in your space? Add a floating shelf that is above eye level to store your wallet and keys. This will allow you to store your wallet and keys out of your line of sight and as an added bonus you can hang hooks underneath to hang coats. 4. Anchor the space. Unless you have a mudroom that is in a different room separated from the line of sight of other spaces, I recommend creating visual difference in your entry. You can do this by adding a different type of flooring to the space, adding a patterned rug, painting the door or an accent wall in a bold color or hanging an over-sized piece of artwork. These elements will act like a punctuation mark at the end of a sentence — it marks the end of the long hallway and provides a clear destination. 5. Add a wastebasket. This is my favorite tip - it is so simple, yet so effective! Drop a wastebasket by your entry so you discard of any junk mail, receipts, catalogs and other paper waste right there and then. That way, this waste wont even have the chance to make it into the rest of your home. To keep it classy, try using a wicker or wire basket that will hid the contents inside while still adding a bit of style to the space. Not sure how to incorporate these functional tips in your space? Contact me and I can help! Lately I've noticed a growing trend of more and more clients defining their style as 'eclectic'. This is a design style that seems to have slightly different meanings to different people. Some clients use it to mean that they really like everything while others have a more specific style combination in mind (like the mod farmhouse kitchen in the 4th image below). /əˈklektik/: deriving ideas, style, or taste from a broad and diverse range of sources. 1. Use a consistent color palette. While you may have a few loud, brightly colored pieces in the space it's best to stick with a few neutrals to help tie all the elements together. The two rooms below use a tan, natural wood base to help tie together the variety of patterns and artwork. I particularly love the way the image on the left contrasts a traditional table and portraiture with bold contemporary artwork and lighting. 2. Layer textures and materials. Texture creates depth in an eclectic space. A rich collection of textural elements makes a space appeal to our senses and resonate on a visceral level. In the images below, nearly every surface in the spaces bring something different to the party. In the image on the left a painted concrete floor is topped with a fur rug, a leather couch set and knit MCM chair. The elements are all offset by a neutral white wall, making the stand-out pieces really pop. The image on the right is a bit more subtle. Mixing hardwood floors with a high-pile rug, leather furniture, metal chairs and flat images of primary color fruit. 3. Anchor your room with a statement piece. Have one piece that you absolutely adore? Make it stand out by giving it pride of place. Don't let it fade into the background! The image on the left highlights a luxurious blue Chesterfield sofa by pairing it against the hard surface of the mirrored table and stark white chandelier. The image on the right makes the red sculptural case pop by putting it against a grey background. 4. Create repetition. Visual echoes, from color to shape to finish, help an eclectic room find its rhythm. Look closely: This dining area is essentially a series of rectangles, from the windows and the framed artwork to the table and rug. And while the color palette may seem bright and randomized, the blues, pinks and tans are consistent throughout the room, visually connecting the room as your eye moves from one end to the other. Eclectic design is for you if matching furniture sets make you feel a bit itchy. If your iTunes mix skips from Bach to Bjork to Beyonce. If you are a collector of Japanese pottery or Folk Art but don't necessarily want to build your entire home around the pieces. Sound like you? Take the JZID style survey today to schedule a style consultation with JZID. With wind chills getting down to -25 degrees in Milwaukee today, I wanted to take you on a virtual trip south of the Equator to Brazil. When I say Brazil, you probably picture a bikini-clad bronzed goddess on a beach or the vibrant multi-colored houses of the favelas. In the last couple of decades, Brazil has been a great influence on design around the world and a leading force in modern architecture. Its lush, tropical landscapes also happen to pair gorgeously with rustic modern furniture and the bright modern art its known for. See some of my favorite Brazilian interiors below. I hope you all had a wonderful time with your friends and family over the holidays. To start off the New Year, I thought I'd shed some light on an easy way to refresh your home in the New Year - updating your wall colors. Year after year, paint companies publish color trends that will set the tone for the next year. This year, the common thread that can be found throughout all collections is a theme of change. The companies are forecasting that we are finally starting to move from our safe calm neutrals cautiously into muted color. I reviewed the color trends by Pantone, Benjamin Moore, Sherwin Williams, Pittsburgh Paints, Dulux, Behr, Clark and Kensington, Valspar and more and chose my top 4 trends. Pantone describes this color as "Much like the fortified wine that gives Marsala its name, this tasteful hue embodies the satisfying richness of a fulfilling meal while its grounding red-brown roots emanate a sophisticated, natural earthiness." While this color runs the risk of looking outdated (remember the 1980's trend of going with a Tuscan feel), the color itself is gorgeous in small doses. I wouldn't do a full room in this color, but could see using this color paired with natural wood tones, green plants and white trim. Think about adding pillows and throws, reupholster your dining room chairs or add a kitchen backsplash in this color. Dulux is an English paint company that defines 2015 paint trends based on how continual connectivity through technology has reinforced our basic human desire to connect in the real world. Dulux poses 4 ways in which we can use color to connect to ourselves and others. My favorite is the Earthwerks collections, which strives to get in touch with nature on a more personal level. Earthwerks explores our desire to have greenery in our homes and workspaces, which is something I'm a big supporter of (see my post on adding greenery to your home). The palette draws from greens and mineral hues to create spaces that allows us to get in touch with nature on a more personal level. A favorite paint brand of mine, Benjamin Moore, released Guilford Green as the 2015 Color of the Year. Along with this natural neutral, Benjamin Moore also released 22 other color trends, organized into 3 collections. While I like the palette Benjamin Moore has come up with this year, a couple of colors stand out from the California Cool collection - Guilford Green and Blue Danube. Benjamin Moore positions Guilford Green as a color that can be either the hero or the highlight in any room, enhancing the architectural identity of a space. It is way to connect nature, spaces and interiors with color schemes that signify fresh energy and growth. Blue Danube is a fresh, vibrant color inspired by the blue California skies. I love this color for a bedroom or dining room. Pittsburgh Paints brought together color experts from around the world to collaborate on the 2015 color trends. After much debate, Pittsburgh Paints announced their collection of paint trends called 'Possibility', which encompasses 4 new palettes. While the color of the year is the vibrant and bohemian shade, Blue Paisley, I am more a fan of the muted palette of the IntroSense line. The IntroSense palette is soulful and peaceful. The trend introduces a new direction in minimalistic styling that blends clean, pared-down designs with quiet nature. The colors pair well with natural elements like driftwood, stone, and bark. The palette is perfect for a spa-like bathroom. Thinking of refreshing your home's color palette? Contact me for an in-home consultation and we can have your home looking fresh in no time! It's every fashion lover's dream to have a custom-made closet. See how I transformed my client's spare bedroom into a functional, contemporary dressing room. Before and after photos below. Before - The space had very little storage and an awkward flow caused by a closet that is half the size as a standard closet and an 'L' shaped layout. After - I transformed this former spare bedroom into a functional dressing room. The concept is much like a retail space. Through the use of a hanging closet bar, floating shelves, wall hooks and an open concept closet, the client can now go shopping for her clothes, bags and accessories. The result is a contemporary space that breathes new life into the client's existing clothing. Expert Tip: Instead of doing a traditional full-length mirror in the dressing area, I took 4 mirrors and stacked them to increase in the sense of space in an otherwise small section of the room. The mirrors were less expensive than buying a large mirror that would fill the wall and makes a bold statement. Expert Tip: When it comes to open concept, simplification is key. You don't need to throw every piece of clothing you own on the hanging closet bar. Try displaying only seasonal clothing that you will wear in the near future and put the rest of your clothing in storage. When it comes to staying organized, purging is the key. Don't be afraid to let go of clothing that you haven't worn in years! You want your closet to be an inspirational place. Showcasing items that you haven't touched since your college days wont give the desired effect. Toss out those ripped and stained items and donate what you can. Expert Tip: For many of us, makeup is more than just a product, it is almost a piece of decor. 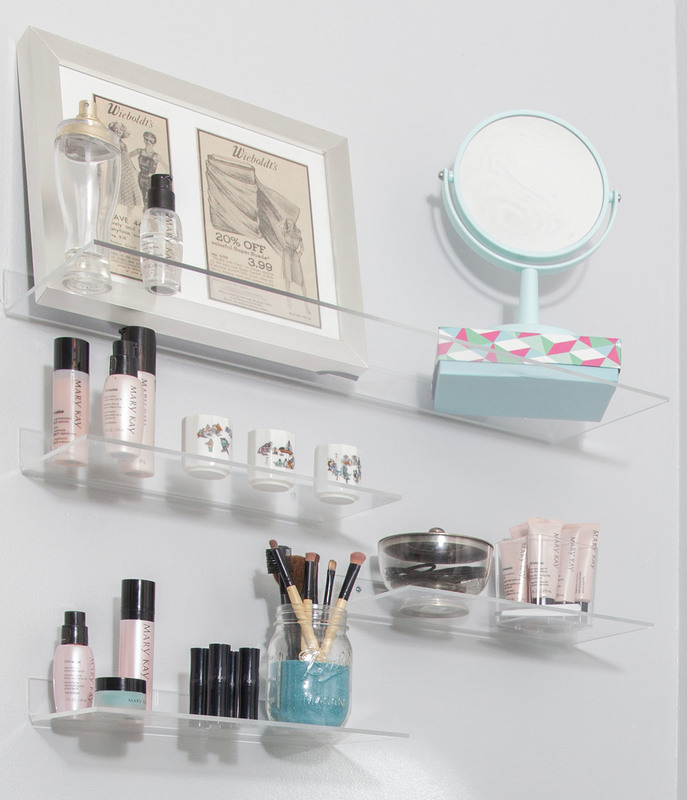 I chose to display the client's Mary Kay collection on acrylic shelves to 1) give more storage than the small MICKE Ikea desk would allow and 2) to draw attention to the beautiful packaging. The creamy pinks and dramatic blacks of the bottles pop nicely off the pale blue wall and tie in with the framed advertisements on the top shelf (a piece that a family member drew back in her advertising days). Expert Tip: If you have a pair of heirloom curtains handed down to you by family members or picked up at Goodwill, then give them a face lift to make them contemporary again. For this makeover, I painted a pair of sheer floral curtains that the client owned with black and silver metallic fabric paint. The result is a dramatic statement piece that hangs from ceiling to floor. Expert Tip: I added retail clothing hooks and bar to the wall opposite the entrance. This way, the client can lay out her favorite pieces so she can be inspired as soon as she walks into the room. This is also a great way to set out outfits to create different combinations when figuring out what to wear! Image Source: All photos are styled by JZID and shot by Ryan Hainey. Winter is here in full force! Sure, there are some really great things that winter brings: winter sports, hot chocolate, sitting by the fire, an excuse to put eggnog in coffee. But let's get real, looking out the window has become a bit depressing - shorter days, little light and blistering wind seeping through my old windows. Here are a few simple tips to help cozy-up your home for the winter so you don't get cabin fever during the hibernation season. 1. Bring the outside in: Not talking about the weather here. Invest in indoor plants, the more the better. Besides making your space more inviting, extensive studies have been done to prove that indoor plants help purify your air quality and even improve your mental health. If you don't have a green thumb then get low maintenance plants like bamboo, succulents, pothos or palms. These plants will survive anywhere! Get creative with your placement - no room should be off limits. I just love the use of the Vipp trash bin and tree print! 2. Layer textures: Sheepskin rugs and throws have skyrocketed in popularity the last couple of years... and I'm still not over them! Here are some great examples of how to use sheepskin and other [fake] fur to warm up your space. Fur isn't the only options, you can also go for wool, cashmere, knits and any other comfy fabric. 3. Light the fire: Spruce up your fireplace mantel and hearth to really make it a gathering space. There is nothing more cozy than curling up in front of a roaring fireplace!